Every year there are certain colors you see everywhere you look. Flip a fashion magazine, open a home decor catalog, browse clothing store windows, it doesn’t matter where you look — certain colors will jump out at you. This is not by chance. Color trends are designed ahead of time by designers around the world who essentially agree on the coming year’s palette. It is not a stretch to say that the world’s foremost authority on color is a woman named Leatrice Eiseman, the Executive Director at Pantone. If you’re a graphic designer, you’re already familiar with Pantone, but most people don’t know about this company. What they do is standardize colors for printing, fabrics, and basically everything in your life. They create the recipes and formulas for how colors are mixed and what they are to be called. 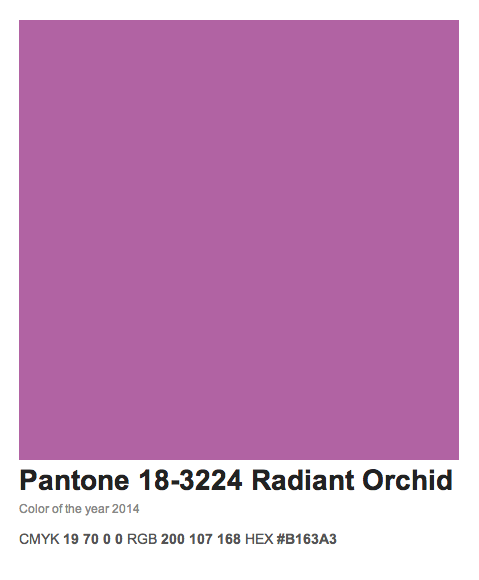 For example, 2014’s color of the year is PANTONE 18-3224. Otherwise known as CMYK 19 70 0 0, which is its color formula. But to you that color will be Radiant Orchid and you will see it absolutely everywhere if you pay attention to it. This sets the tone for 2014, which will be dominated by delicate flower inspired pastel hues. These colors, in the words of Leatrice Eiseman, represent “a state of thoughtful, emotional and artistic equilibrium” while “the inherent versatility of the individual colors allows for experimentation with new looks and color combinations.” In other words, next season’s palette will be easy to work with because the main colors all gel together, but also allow for a lot of individual expression. Because of these color choices, expect to see a shift toward a lot of tropical flowers in weddings next summer. Bright, bold, and expressive. To counter the splashes of colors, you can also expect to see more grays and neutrals. Gray bridesmaid dresses are expected to make appearances, as well as warm gray and neutral colored suits for grooms in outdoor daytime weddings. It might feel strange to know that the tone for next season is already orchestrated, but it is also reassuring in a way. Let it be a starting off point for planning. Think of it as a headstart.